Assateague wild ponies have roamed the beaches, pine forest, and salt marsh of Assateague Island since the 1600's. Assateague Island National Seashore has a combined total of over 300 wild ponies in Maryland and Virginia. Some people believe the horses arrived on Assateague's shores when a Spanish galleon ship (with a cargo of horses) sank offshore. Others believe the horses arrived by early colonial settlers that allowed them to graze there. A Spanish ship wreck was discovered recently in the waters off Assateague which lends credit to the first theory. The ponies have become well-adapted and enjoy the solitude Assateague Island offers. Marsh and sand dune grasses, rosehips, bayberry twigs, and persimmons supply the bulk of their food. 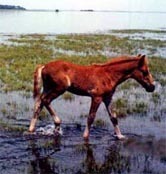 Assateague ponies are often found feeding on the salt marsh cordgrass along Assateague's western shoreline. When traveling by boat, you may encounter Assateague ponies along extensive bay habitats and pine forest of the 37 mile barrier island . Both Maryland and Virginia sides of Assateague have wild ponies, each has a herd of about 160. A fence at the Maryland/Virginia state line separates the two herds. The wild ponies of Assateague are usually seen in groups of about 5-10 animals. The National Park Service and Fish & Wildlife Service have conducted resource management studies to ensure the wild horse population is maintained at a level the seashore environment of Assateague can tolerate. Resource management techniques are different in Maryland than in Virginia when it comes to maintaining a healthy population of wild ponies. In Maryland, some female horses annually undergo a contraceptive vaccine administered through a dart gun. This has proven to reduce high pregnancy rates with no harmful side effects. Wild horses in Virginia are part of the Annual Pony Swim (started in 1924). Approx. 150 wild horses are rounded up on Assateague the last Wednesday in July. The horses swim across the Assateague Channel to Chincoteague Island where an auction takes place to reduce their numbers on Assateague. After many of the foals are sold, the remaining herd swims back to Assateague a couple days later. These management techniques reduce the impact the horses pose to their natural environment and help provide a sustainable resource for future generations.